1. Our India Sudar member Mr.UmaMahesh.P donated his used computer(CPU, Monitor, Keyboard, Printer) to India Sudar. We are moved this computer to Kadesh Childrens Happy Home, L.B.Shastri Nagar (near HAL), Bangalore on 26-Aug-2007 using Ravi Kumar.K Car. Sahashra Deepika school organised a very good Independence Day celeberations. Some of our India Sudar bangalore friends (Udhay Kumar, Ravi kumar, Ram, Vinod, Raghu and Shiva) enjoyed the function really well. Another organistaion called ashwini trust from Ulsoor, Bangalore also attended the celebrations. The function was really well organised & higlight was the excellent performance by the kids of the home and students of Ashwini Charitable Trust. All the events were well practised and performed. We were back to our good old school day celeberations. Our sincere thanks to Dr.T V Ramakrishna and Mrs. Vijaya Ramakrishna, founders of Sahasra Deepika school, who had invited us and gave us an oppurtunity to see the kids perform. The function ended with a great lunch arranged by SDIE. We also intercated with founders of Ashwini Charitable Trust Mrs (http://ashwinitrust .org/index. html) and their students. In the week end we are planning to visit the Ashwini trust also. Will update more on that. A note has to be made on Dr. T V.Ramakrishna, who is a very inspiring person. Leaving a lucrative career in US as professor, he headed home to help the underpreviliged. Today he has 80 kids from different parts of the country. In fact he is even willing to give full administration guidance to those who are willing to start school for Orohans/Underprevil iged. We were very much inspired by his vision & clarity of thoughts ! It was a memorable 60th Independence day for us ! It is our responsibility to extend all the help we can for the school !! On 11-Aug-2007, We(Hari.T, Suresh.R, C.Senthil Kumar, Udhaya Kumar,V) visited to Home for Destitute Children(Govt Children Home for Boys), Royapuram, Chennai. Who maintaining this Home ? State government maintaining this home, In Tamil nadu we have 8 homes in different district. Every state in India having this type of home for Destitute Children and its based on the state government interest/influence. How or Which Children coming to this Home ? In city police, separate department works to catch any children rooming in bus stands, railway station and signals without parents. Same as any begging children and child labours, etc. First this police man try to get the information about there parents and try to handover to parents itself, if they are not able to find out, they will send this children to this Home. These kids not involved in any criminal activities. How this Home Works ? Reception: its hall and completely closed, children can’t come out from this place, this hall having one TV, some sports item, toilet, etc. They need to take the food inside itself. We can see one security in side they will monitory. They have two receptions, one for below age of 13, second one for above age of 13. Why this home is having School ? If they are not able to identify there parents or native place, they will put that children in this school for regular education. How we can help ? What is there need ? 1. In school, they have only 4 teachers. One of the teachers was retired. Government not deployed any teacher for this posting. So we can file. 2. This school students asking several education materials, we can provide. 3. In Reception, we can deploy teacher to provide non-formal education, it may be anything, because this children in this room for more the 3 months. Just they will watch TV and sleep. Some time they will play inside games. 4. We can provide some indoor games material for this students. 5. Any way already we are planning to contact cultural program only for School students. 4.10/TN/2007_08; Abirami, 9th Std student project implemented successfully. We have successfully implemented another project for a poor student, Abirami. She was referred by Lalitha, Newlife. She is doing her 9th Std. Attached are the project report and her performance report. We immensely thank Ramanujam, Kanimozhi, Pari and Indiasudar members, for their support to execute this project. We are responsible for what we are and whatever we wish ourselves to be. —–Swami Vivekananda. Hope you all read our previous mail (below mail). We had paid Rs. 8000 for Admission and School fee for Vijay Paul yesterday. Today is his first day of his school. Vijay Paul is second son of Sophia. survival. She is very ambitious to provide quality educate her sons. She was looking for someone to help her financially to pay school fee. One son got admission at Saharsa Deepika Institute for Education (http://www. sahasradeepika. org/) at free of cost with boarding. 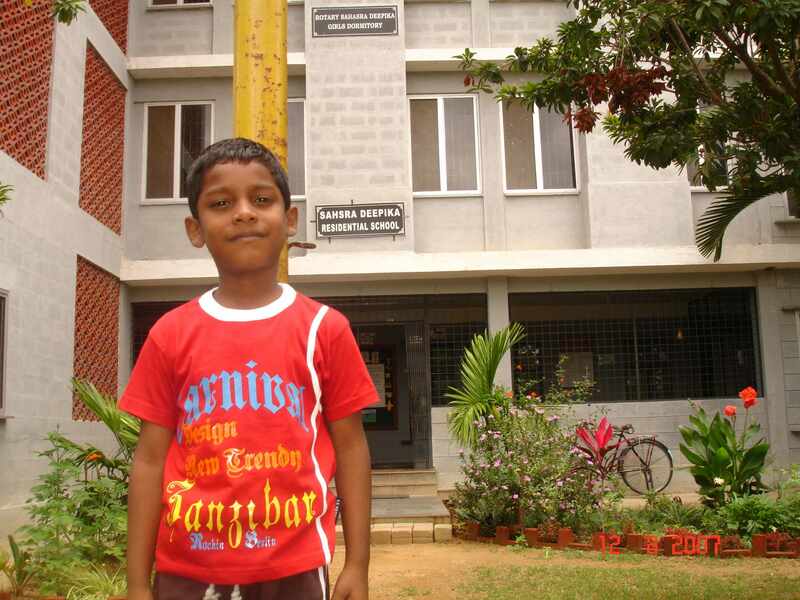 Second son got admission at Kids Global School, 1st Cross, CT Street, Marathahalli, Bangalore. School Fee Rs. 8000 per annum to be paid. Our sincere thanks to fundowners and others put their effort to help the poor student. We also communicated to Sophia (Student’s mother) that she has to save money and take care of his educational expenses from next year onwards. Please find the project report attached with this mail and same will be uploaded in indiasudar website soon. a boarding school to admit her twin boys and continue their education. Both are doing second standard now. I met her at Tyagi’s residence about 3 weeks back. Sophia is from Nellore, she went against her family for love marraige about 7 years back and she is left by her husband with her twin boys.She is not getting any support from her family except her sister. She is working as servant maid in few house and making around Rs.2000 per month. leaders beat them badly to wake them up in the early morning and follow the descipline. Since these boys are very small and doing second standard, they are not able to bear that torture and came out with lots of injuries. When she complaint to that church father, he could not help it seems. He said that they need follow some rules for all to grow the students with descipline. She was looking for another boarding & convent school, so that she can work and support their education as well. We had discussed with volunteers of Sahasra Deepika Institute for Education (India) (SDI – http://www.sahasrad eepika.org/) Karthik , Usha and Arun. They made Sophia to meet the board of directors and founders Dr. T V Ramakrishna and Mrs. Vijaya L Ramakrishna and they agreed to admit both of her sons at their boarding school. The entire quality education and boarding is at free of cost until II PUC. However, she wants to keep one son with her custody for various personal reasons and she found a school for him near Marathahalli. We found sponsers from Employee of Samsung India Software Operatios to pay school fee (Rs.8000) for her second son as well. We would send our detailed report in the next mail. So her first son would continue his education at Sahasra Deepika Institute for Education (India) from next week onwards. Our sincere and heartly thanks to founders Dr. T V Ramakrishna and Mrs. Vijaya L Ramakrishna for providing such a quality education for poor students. We extend our sincere thanks to volunteers Usha, Karthik and Arun for their great help and follow up.